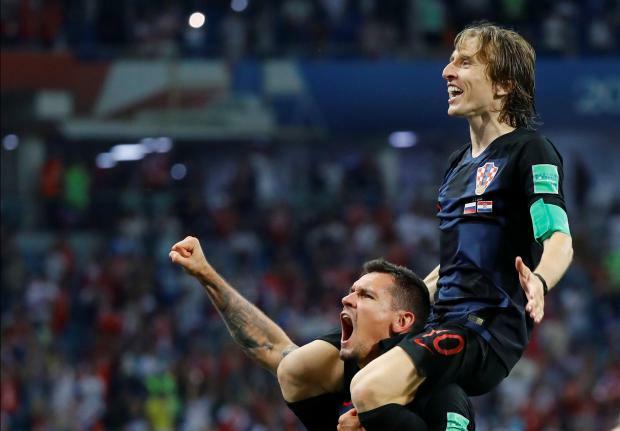 Croatia's Luka Modric and Dejan Lovren celebrate after the match. Croatia defender Domagoj Vida put them 2-1 ahead from a Luka Modric corner in the first period of extra time but Russia's Mario Fernandes headed an equaliser with five minutes remaining, much to the delight of the partisan crowd at the Fisht Stadium. Denis Cheryshev's swerving left-footer from the edge of the box had opened the scoring for Russia in the 31st minute of normal time but an unmarked Andrej Kramaric headed in a cross from Mario Mandzukic eight minutes later to restore parity.